There’s a little restaurant downtown that my husband takes me to every once in a while. It’s a beautiful special little French cafe with the most gorgeous French dessert case. It’s filled with colorful macarons, delectable chocolates and my favorite, napoleons. They also have the best French salads and sandwiches. I’ve had just about everything on the menu, but the one thing I keep going back to is their Normandy salad. In fact I crave it so much that I had to start making my own version of it at home. 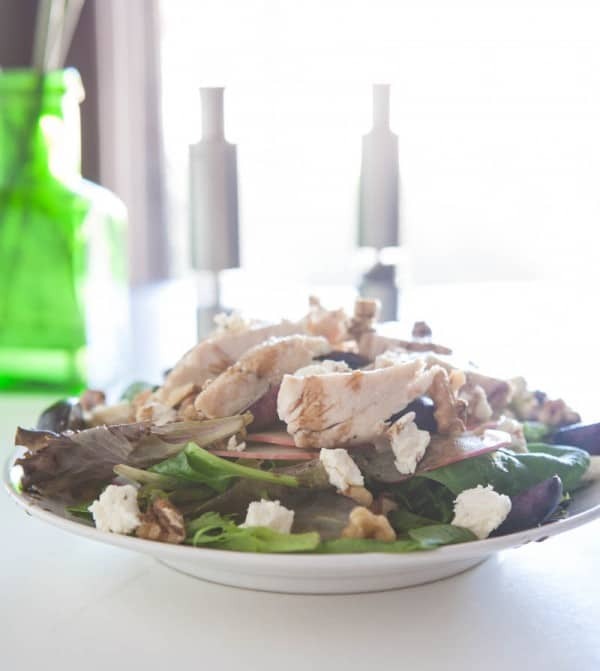 It’s a simple, beautiful salad made up of fresh spring greens, crisp apples, sweet grapes and tangy balsamic vinegar dressing. 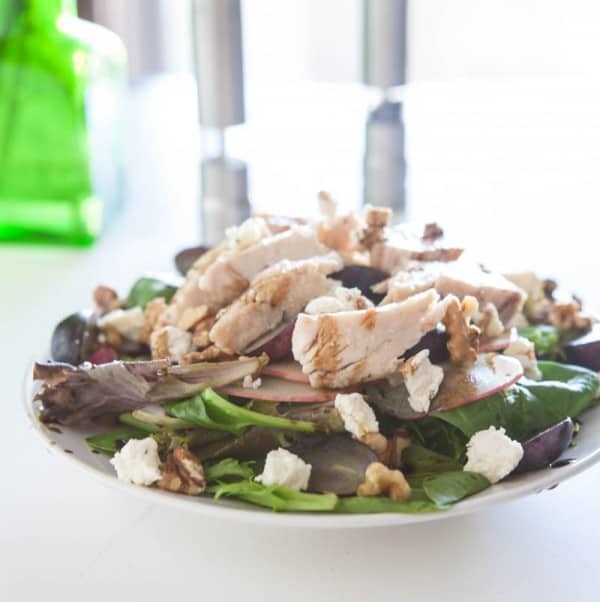 This salad is the perfect mix of sweet and tangy and is so easy to make. I start with fresh Tyson® Fresh Chicken boneless skinless chicken breasts. Did you know that Tyson Fresh Chicken has been raised by family farmers for more than 75 years? It’s all natural* with no added hormones or steroids**. I simple season my chicken with salt and pepper and grill it outside. I love the flavor that the grill adds. But if it’s too cold where you are to use your grill right now, you could just as easily make this chicken on a grill pan inside on your cooktop. I also like to add lots of nuts to this salad. So I toast some walnuts in the oven just until they’re nice and fragrant. 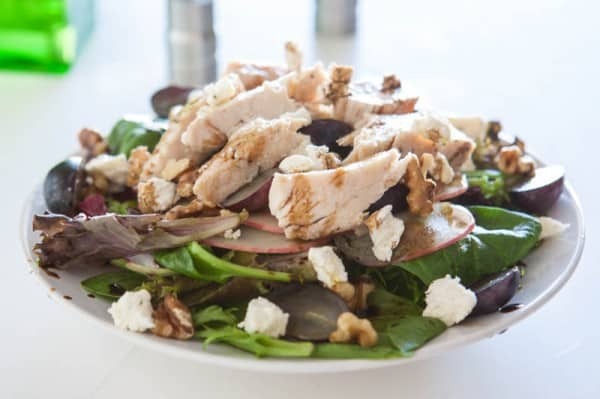 This really brings out the flavor of the walnuts and makes this salad oh so special. To make the salad, I start by layering the salad greens on the plate and then topping them with thinly sliced crisp apples. I used HoneyCrisp for this salad, but fell free to use whatever variety of apples you have on hand. Then I add halved black grapes an the roasted walnuts. Next I slice the grilled chicken and add that on top. The restaurant serves this salad with brie, but like to use boursin at home. You can buy it in any flavor you like. Here I used a garlic herb boursin. To finish off the salad, I top it with a tangy balsamic vinegar dressing. You can use a store bought dressing or make your own. I like to quickly make my own in a little mason jar. For my dressing I used fresh grated garlic, balsamic, olive oil and salt and pepper. It’s also simple yet a perfect pairing for this simple and elegant salad. Find more recipes at PickTysonFresh.com. Heat grill to medium heat. Brush chicken breasts with olive oil and sprinkle with salt and pepper. Grill chicken until done, about 15 minutes, depending on size and thickness of breasts. Internal temperature should be 165°. Combine all ingredients for dressing a small jar or bowl. Mix well to combine. Set aside. Layer lettuce, apples, grapes, walnuts and bourbon cheese. Chop grilled chicken and add to salad. Drizzle with salad dressing and serve. This post sponsored by Tyson Fresh Chicken. All opinions 100% mine. I wish I had this for lunch today!